Choose 6 dates to complete the sessions, consisting of 6 x 3 hour sessions and a free 2 hour Practice Session, available daytimes, evenings or a mix of both to suit your schedule. Becoming a great DJ involves learning some essential time-honoured skills; skills that our tutors have spent many years honing and perfecting. We can fast-track you to learning these and opening the door to exploring your own style, tricks and techniques. An essential love of music and the desire to share it to rock a crowd is all you need to take our Masterclass. It’s never too early or too late to start on your DJing path. Our course is dedicated to you and designed teach a well-rounded set of skills over a consistent set of stages. Each course is tailored to suit your needs as you progress throughout your learning. 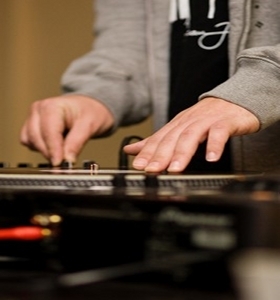 Everything we can teach below can be adjusted to get you to where you want to be as a DJ. Learn on our club standard Pioneer CDJ 2000 Nexus decks and Pioneer mixers plus your choice of our Laptop/DJ controllers running professional DJ software (Traktor, Serato DJ, Rekordbox, Virtual DJ and others) and, if desired, Vinyl/Turntable DJing. All equipment and music (of various genres) is provided by us and students are welcome to bring any equipment they already own so we can help you master that too as part of your course. – Your DJ career: Advice on buying equipment, refining ‘your sound’ and style, what you want to get from DJing, recording and editing demo mixes, promoting yourself as a DJ, getting gigs, performing to and working with different audiences at different venues and events. Throughout the course you will have plenty of opportunities to ask any questions, review and recap any of the skills you have learnt. A digital copy of your graduation DJ mix recording will be emailed or given to you on your final session. Your Masterclass Course includes ongoing support from our team after your course; advice from tutors as you progress with your DJing as and when you need it. Masterclass Students can access special discounts on Studio Time at our Academy to practice or record demo mixes in the future. Book below and a member of our team will be in touch to help you select 6 dates and times for your sessions. Choose your payment option from the drop down list below, complete your details and the ‘Buy Now’ button will take you to the PayPal website for secure safe payment which will also email you a receipt. If you don’t have or prefer not to use your PayPal account, please select the ‘Pay with debit or credit card’ or ‘Check Out as a Guest’ option to pay via a debit or credit card.